Start by opening a DS9 window before running this task and by editing the parameters for the task "standards". instrumental system to those in the standard system (Johnson, SDSS, or Persson). 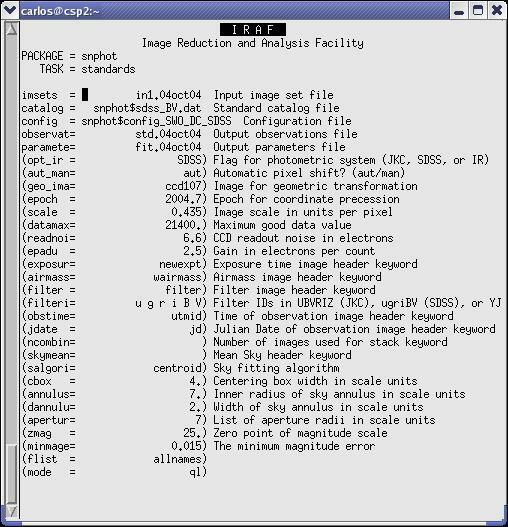 the field names in the catalog file (snphot$landolt.dat in this example). images. Make sure that there are 6 image names per line. example) which defines the transformation equations for the different filters. the rms of the fit. coordinates, which must be specified in the "catalog" file. The parameter "epoch"
is used to precess the equatorial coordinates to the epoch of observation. IDs in the headers under the keyword specified under the "filter" parameter. The filter order must be either "UBVRIZ", "YJHK", or "ugriBV". "minmage" which is the "minimum magnitude error". values and that the X and Y axis rotation values are similar. been processed, the task will proceed with the next image set. of the plot, and the RMS of the fit is given in magnitudes. to plot in the XY axis. Here you want to type "xb,residuals". you to judge if there are fields with systematic residuals. If so, you can proceed to delete the entire field with 'd'. You will have two new text files at the end. In this example "std.14dec03"
contains the instrumental magnitudes and uncertainties. The file "fit.14dec03"
extinction coefficient, a color term, and a zero point.